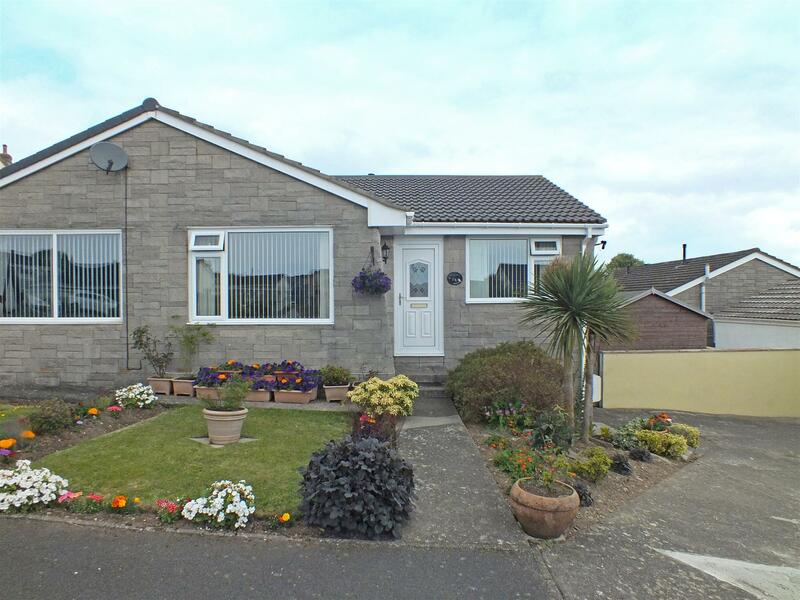 Modern Semi Detached Bungalow Located at the Head of a Pleasant Cul De Sac. Close to Main Bus Route, Local Shops, School, Doctors & Pub. Easy Access to Douglas. Extended Bathroom, Added Dining Room / Sun Lounge & Re-Roofed Approx 2011. Accommodation Also Includes a Good Size Lounge & Modern Kitchen with Appliances. 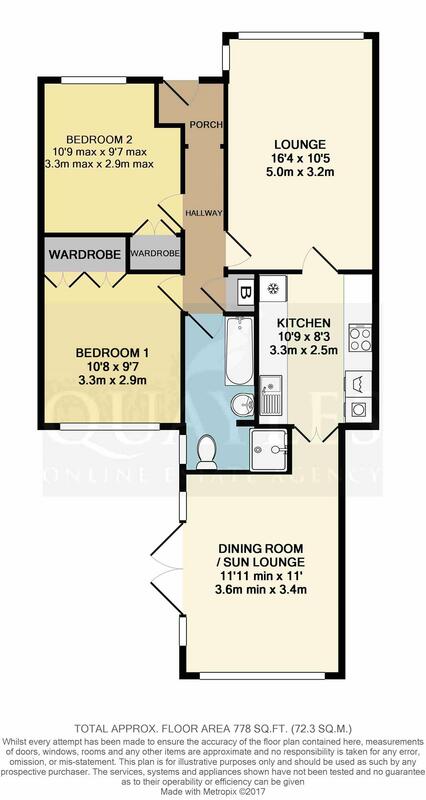 2 Double Bedrooms Both with Wardrobes. Fully Tiled Bathroom with a 4 Piece Suite Including a Separate Shower. Open Plan Lawn and Flower Beds to the Front. Large Wooden Shed. Fully Enclosed & Paved Rear Garden Enjoying a Sunny Aspect & Much Privacy. From The Quarterbridge roundabout head South along the New Castletown Road. Continue through the first set of traffic lights and on to the second, taking a right turn into Anagh Coar Lane. Follow the road up and around, past the shops and take a left turn after Springfield Grange Nursing Home, into Ballaquark. Continue ahead, taking the second turn on the right where number 94 will be observed in the top right hand corner, being clearly identified by our For Sale board. A half decoratively glazed uPVC entrance door leads into the porch with an open doorway to the hall. Cupboard housing the consumer unit. Coved ceiling. Storage cupboard housing the 'Saunier Duval' gas fired combi boiler. Access to the insulated loft.. Coved ceiling. A good size, dual aspect room with uPVC windows to the front and side with fitted blinds. Coved ceiling with a modern spotlight fitting. TV and satellite points. Door to the kitchen. A wide galley style kitchen fitted with a superb range of cream coloured shaker style wall, base and drawer units together with solid wood block worksurfaces incorporating a single drainer sink with a swan neck mixer tap. Inset four ring gas hob with an electric oven below and a pull out filter hood. 'Hotpoint' automatic washing machine and tumble dryer. Integrated fridge and freezer. Coved ceiling with a modern spotlight fitting. Vinyl floor covering. A pair of glazed multipane doors lead into the dining room extension. A superb addition to the property added approximately 2011. A naturally light and spacious room with a large uPVC window to the rear and patio doors leading out to the paved garden. Coved ceiling. Modern wall lights. NB Measurement excludes the door recess. A double room located to the front of the property and having a uPVC window with fitted blinds. Recessed double wardrobes. Coved ceiling. A good size double room with two recessed double wardrobes to the inner wall. Rear facing uPVC window. Coved ceiling. A large room which was extended when the dining room was added. Fully tiled walls complement a modern white suite of panelled bath with grab rails, pedestal basin with a vanity unit below and a mirror above plus a push button flush WC. A recessed enclosure with sliding glazed doors houses a fully plumbed shower. Space for a tall boy storage unit. Coved ceiling. Two modern spotlight fittings. Chrome heated ladder style towel warmer. Vinyl floor covering. Obscure glazed uPVC window. 'Addvent' extractor. A well kept, open plan lawn with planted borders and a concrete pathway to the main entrance. Steps down and gated access to the rear garden. A lower level hardstanding has a large wooden shed for storage. Steps up to the main garden which has been fully paved for ease of maintenance. External lights, power points and cold water supply. Walled for privacy and security. All mains services are installed. Gas fired central heating and uPVC double glazing.